Last week one of the crew traveled to Cebu for the day to deliver some important documents, that could not be sent by commercial courier, and run some errands. On his way home, he brought some precious cargo… 4 kilos of freshly made and packed daing na danggit, 10 kilos of pomelos and some fresh tuba (fermenting coconut sap) for some torta recipes I have been laboring with. Turns out tuba is NOT allowed on flights out of Cebu, even as checked in luggage, so other arrangements had to be made. Suffice it to say the bottle of tuba was in our kitchen the next day, and the less I know about its journey, the better. 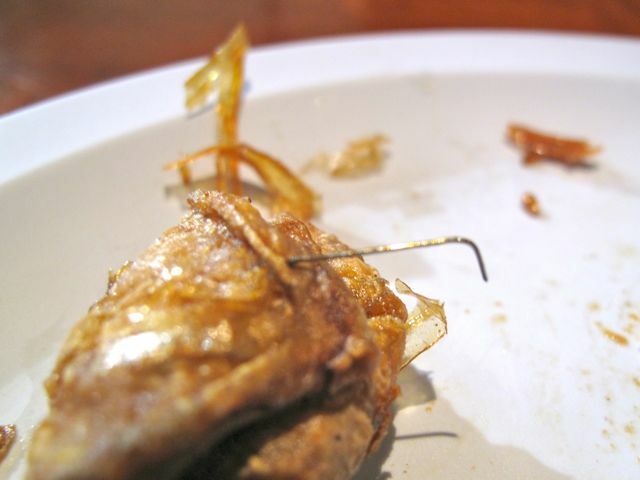 :) A few days later, some danggit was fried up for breakfast and this is what was found in one of the pieces of crisped up fish… a pretty wicked looking staple wire! I have railed against the use of staple wires in general before, and in food packaging in particular as well, so this is just proof positive that staples have no place near any food items. I doubt that the acids in your stomach are strong enough to dissolve a staple wire assuming you managed to swallow it without feeling it. I know of someone who accidentally swallowed a cocktail toothpick while eating pica-pica in a more than slightly inebriated state, and the toothpick got lodged in his intestine and he subsequently required a fairly serious operation to remove it. So for all those folks manufacturing, packaging and selling food items, PLEASE, PLEASE, PLEASE eliminate staples from your arsenal of materials! These danggit were purchased at a wholesale market in Cebu, so it’s hard to go back and give them a piece of my mind or to identify the actual supplier who may have caused this… but trust me, if I ever buy a food item at a store, bazaar, etc. with a branded name or where I recall the proprietor, I will definitely raise a stink. :( And all intelligent consumers should do the same. 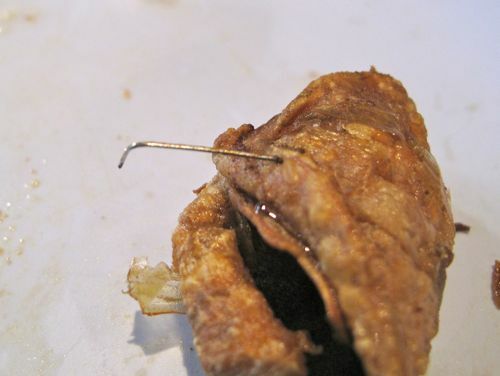 Avoid any food items packaged with the use of staple wires. ang alam ko bawal gumamit ng staple wire sa packaging ng food.pasaway naman kasi ang ibang mga business owners.tsk!tsk!tsk! Aray! Or as they say here in France, aiee! Mr MM do you know that it is around 5:30am in Manila???? Oh, dear! I hope they have MAJOR LIABILITY INSURANCE!!!!!!! i agree with you MM, staple wires should not be use in food packaging. i wouldn’t want to bite into something with a staple wire in it. multiple problems can arise, biting into one would cause major trauma to the mouth/gums; could rip the lining of the throat, (swallowing fish bones or similar objects) esophagus and stomach. but curiously enough, this small piece of metal can be digested in the gastric juices. working with people who swallow inedible objects (toothbrushes, pens etc) i found out that size matters, usually something less than 4 inches will pass if it “lands” correctly (hence the cocktail toothpick). Eeeks! I once watched a “feature” presentation about the processing of dried fish….lahat naka-staple! I mean, the fish are stapled to each other para mag-flat sila saka siguro para mai-pack efficiently. And the couple of times that I encountered staple wire in danggit, akala ko, galing sa packaging. 1) Staple should never be allowed. 2) What’s dried squid doing inside your package of daing na danggit? Typo… Crave is what I meant. as enthused as i am of danggit, I would have swallowed that little metal piece! esp at breakfast, without the eyeglasses!! had the danggit not curled up while frying, the staple could have been more difficult to see, and i cringe at the thought. yes, some dear relatives wanted to send us a few bottles of “export-quality” tuba from the visayas and the airlines wouldn’t accept them, but they were here a few days later! hmm…the locals probably know something we don’t! Good morning Mr market man, i came across your batuan post, a souring agent from the visayan region. I’m just wondering because, a tree have grown on our yard in a matter of one year and now it is bearing lot of fruits just like your posted images of batuan fruits. ( ripe-yellow in color and when unripe, it’s green) There are reddish or pinkish small seeds inside. Can u please tell me what did you see when you have open a batuan tree. I will appreciate it very much if you can post the inside of the batuan tree.Thank you. I once found a staple wire under an eclair from Dulcinea. No idea how it got there since it came straight from their display case. Good thing it didn’t stick to the filling, otherwise, I would’ve chomped on it! Just thinking of it makes me cringe! Rice is our staple food not wire. There are a lot of instances when the safety of the consumer is not considered by the ones who prepare food. Staple wires, dirty work areas, pesticides, rats in the kitchen. What emulsifiers, artificial coloring, and or preservatives are used for butter reconstituted in Makati? I’ve had experiences like this. The earliest one I can remember(over a decade ago) is spitting out staple wire from a can of beans. In college, I’ve tried having paper in my steamed rice; and on another occasion, a small chipped fragment from a plastic drinking glass in one of my pizzas. For the latter two(both are very recognizable, by the way), both establishments were hesitant to admit that it was their mistake even implying that I was the one who placed those things in their food. They sort of eased off with the questions when I said that I was just telling them and I wasn’t making a big deal out of it nor was I asking for any form of compensation. I did not even ask for my food to be replaced. Good pm Mr market man, i came across your batuan post, a souring agent from the visayan region. Iâ€™m just wondering because, a tree have grown on our yard in a matter of one year and now it is bearing lot of fruits just like your posted images of batuan fruits. ( ripe-yellow in color and when unripe, itâ€™s green) There are reddish or pinkish small seeds inside. Can u please tell me what did you see when you have open a batuan tree. I will appreciate it very much if you can post the inside of the batuan tree.Thank you. i found staple wires in my danggit purchased from cebu… just when i was about to put a spoonful of rice, egg and danggit in my mouth! from then on, i would inspect and transfer every single dried fish from its original packaging to another container, just to make sure no1 at home accidentally eats one (esp since we have a toddler at home). hay. I found a staple wire inside a Chewy Chips Ahoy cookie last month. I was this close to swallowing it! Sent an email to Kraft USA about it. Kraft Phils wanted to replace the product but I told them I just wanted to bring the matter to their attention. Sheesh… What if that happened to a kid?? ?